The ASEAN Roundtable is a student-run public diplomacy program at the Graduate School of International Studies, Seoul National University, South Korea. This roundtable was established in March 2018 with a vision of being the best practice of people-to-people connectivity between ASEAN and South Korea. There is an awareness and perception gap of ASEAN in South Korea. The analysis by the ASEAN-Korea Centre (AKC) indicates two essential characteristics that lay the groundwork for the branding ASEAN strategy. First, Koreans are not familiar with the term ASEAN, which refers to a regional organization in Southeast Asia. Second, there are stereotypes towards ASEAN among Korean people, seeing ASEAN as composed of vacation spots and developing countries. To promote impactful branding of ASEAN, the members of the roundtable gathered once a week during the semesters to disseminate ASEAN issues from their perspectives. One presenter prepared his/her analysis while others shared their opinions and criticisms. There were thirteen presentations in total during the two semesters with approximately twenty students attending each session. Sometimes, the organizers offered ASEAN cuisine so that the attendees could appreciate regional taste and smell. Being a bridge-builder for Korean and international students to be more connected to ASEAN, the roundtable plays an active role. The topics were diverse as they covered the three pillars of ASEAN and its role in setting an example for other emerging regional groupings, such as the Economic Community of West African States (ECOWAS) and the Southern Cone Common Market (MERCOSUR) in Latin America. Some presenters touched upon very timely and critical schemes, such as ASEAN’s effective response on trade war and ASEAN’s constructive role in the inter-Korea peace process. The main idea behind this strategy is to provide a platform for the engagement between the members of the roundtable, mostly graduate students and ASEAN-related organizations in Seoul. Institutional visits by graduate students are advantageous for both organizations and visitors. For the organizations, a visit could be deemed an indicator of institutional recognition in Korean society. At the same time, members of the roundtable could have an opportunity to discuss their interests with high-level officials and practitioners exclusively. These people could later serve as mentors or offer resources for a student’s future interview or research. This year, the roundtable plans to expand its network and recognition to all relevant stakeholders and policy actors, including ASEAN embassies, the ASEAN Culture House in Busan, the Presidential Committee on the New Southern Policy and the Korean private sector. As of November 2018, the roundtable has participants from twenty-four countries, mainly in Asia and Africa. 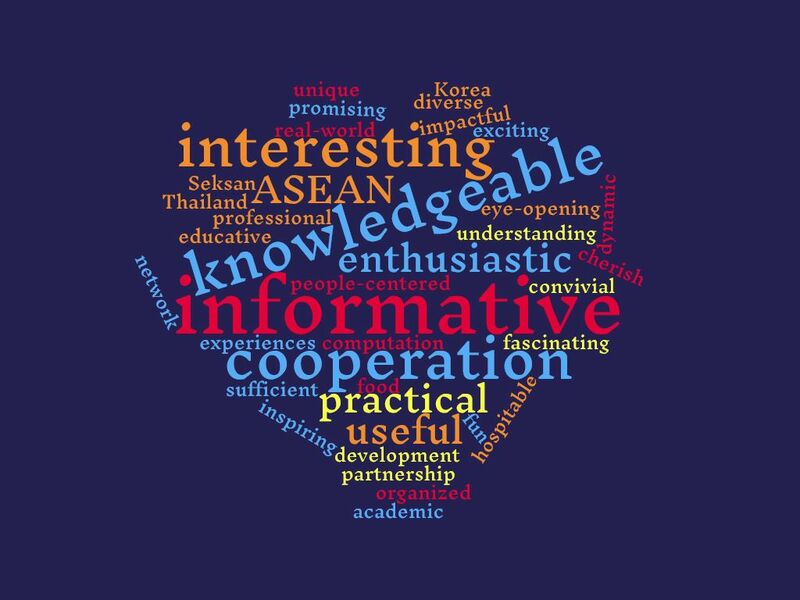 Participant’s answers in the evaluation survey reflected their positive perception of ASEAN. After joining the roundtable, all respondents realized what ASEAN is and how it works. Some of them agreed that this roundtable could benefit their future career, while some decided to continue their studies and research on ASEAN. Below are the key words that best explain what the participants learned from the roundtable. Interestingly, 95 percent of the respondents believed that ASEAN would play an important role in international politics in the next decade while 5 percent were skeptical. When asking about the main challenges for ASEAN, the participants put the influence of external environments over the domestic political and economic strains of each member state. These external challenges included the strategic rivalry between the U.S. and China, dominance of a single great power over the region and disagreement of the member states on regional issues like South China Sea and the Korean Peninsula. There are four learning points from this student-run public diplomacy activity. First, this program has been in line with the government’s New Southern Policy that could automatically attract institutional support and its potential audience. From my personal conversation with attendees, they see this as one of justifications for their participation. Second, clear objectives and strategies help the organizers shape the program and mitigate risks. Presentations and institutional visits were selected as core activities because it was coherent with the nature of the participants. Third, media strategy is required to enhance the publicity and awareness. The roundtable implemented several measures. After finishing each week’s activity, the coordinators posted the description in a Facebook public group in order to keep those who missed the session updated. This group also plays a role as an information-sharing online session. 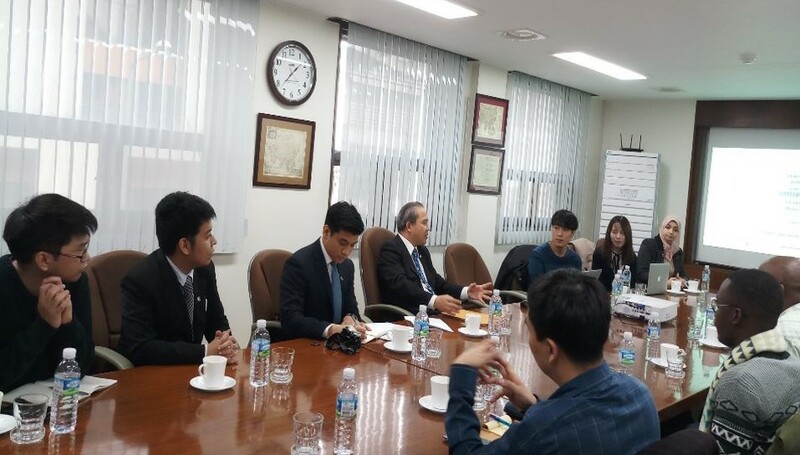 In addition, the coordinators shared the story of the roundtable both in English and Korean with online platforms for ASEAN-related organizations in South Korea, such as the AKC’s blog and website. Finally, identifying and engaging strategic stakeholders is important. In this case, the roundtable has gained valuable support from two institutional partners, the AKC and Yulchon LLC. As the lead coordinator, I would like to express my appreciation to them for taking part in this initiative that could benefit the future generation of ASEAN and South Korea.